As you may know, Bunker Hill isn't the only show in town. Spike was in town filming a pilot called War of '04 (here) and apparently Dana White of UFC fame is at the helm and caused a bit of a stir with some comments that he made. The Spike TV pilot, whose working title is "War of '04," is inspired by Boston's Irish mob. It's about a Whitey Bulger-esque mob boss and the explosive battle that erupts when he abruptly disappears. If there were any doubt, a couple of real-live wiseguys, albeit retired ones, were on the set yesterday. 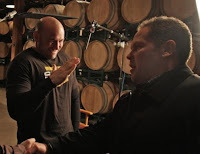 While actors Kevin Chapman, Matthew Marsden, and David Patrick Kelly were filming a scene inside the Boston Winery building on Ericsson Street, two former Bulger boys, Jimmy Martorano and Pat Nee, were chatting nearby. Unfortunately, White wasn't at the Boston Winery yesterday, where "War of '04" will be filming for the next few weeks. Click (here) for the first Globe article. Click (here) for the second Globe article. 1 Response to "War of '04 Filming at The Boston Winery"
Word on the set is Spike-TV picked up "War of '04" before they even finished filming.